A saying from the Vedas claims that “Speech is the essence of humanity.” All of what humanity thinks and ultimately becomes is determined by the expression of ideas and actions through speech and its derivative, writing. Everything, the Vedas maintain, comes into being through speech. Ideas remain idealised until they are created through the power of speech. Similarly, The New Testament, Gospel of John, starts “In the beginning was The Word. And the Word was with God and the Word was God.” Different cultures use language differently. The Buddhist and Hindus have always looked for esoteric sounds that correlate with the universe. The Latin language, also ancient, led to the Monks creating perfect mantras in the musical composition of the Gregorian chants. Gregorian chant has been used around the world in the Roman Catholic liturgy for over a thousand years. The chants are most closely associated with the Benedictine order of monks, who would use the chants daily in services and in prayer. The Gregorian tradition superseded the Ambrosian, Gallican, and Mozarabic chants between the eighth and 11th centuries, except in Milan, where the Ambrosian chants are used to this day. The chants formed part of the day to day worship; the choir, clergy and congregation would sing prayers instead of saying them. The outer triangles are occupied by divinities which represent the subdivided energy-self of the Great Goddess. A standard table providing complete information about the file, including description of what it shows and how it was made, copyright status and source. Yantras are of geometrical design and traditionally contain the energy of a particular deity as perceived or seen by ancient rishis or enlightened masters. They are visual forms of mantric energy and often contain a mantra associated with it. Yantras are also used for purposes such as to attract harmony, peace, enhance learning and the quality of one’s life, promote healing, and more. Though drawn in two dimensions, a yantra may represent a three dimensional sacred object. Once such example is the 2D representation of a 3D Maha Meru as shown here in the yantra image. They are made out of metal plates like copper, created on silk fabric or paper, and used for worship and meditation. 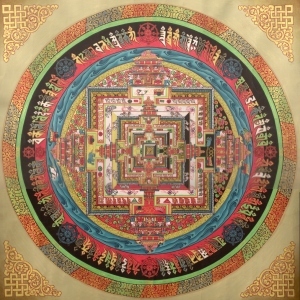 Even if the yantra art enthusiast is not a meditator, it’s ok. 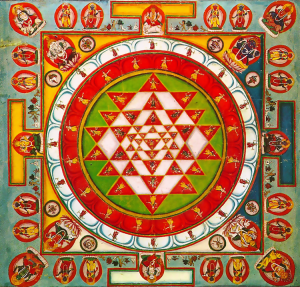 Viewing yantra art itself works through its symbolism subtly on you and your environment infusing it with an uplifting, healing and centering energy. It helps you to connect with the center of your Being to experience more inner peace, bliss and harmony in your life. In ancient texts, Lord Shiva is supposed to have explained the mystical meaning of the yantra to his consort Goddess Parvati. Keeping yantra art like a Sri Yantra is an expression of the Divine Mother Goddess, or a Maha Meru image, a three dimensional representation of the universe, in your home, or on an altar, is auspicious. These images can be used for worship or as meditation and centering devices. the flow of vibrant energy of health and abundance. Yantra may be used to represent the astronomical position of the planets over a given date and time. It is considered auspicious in Hindu mythology. These yantras are made up on various objects i.e. paper, precious stones, metal plates and alloys. It is believed that constantly concentrating on the representation helps to build fortunes, as planets have their peculiar gravity which governs basic emotions and karma. These yantras are often made on a particular date and time according to rules defined in the vedas. Several aspects must be distinguished in the universal vogue of the sacred formula – a vogue that, on one hand, led to the highest speculations on ‘mystical sounds,’ and on the other, to the Lamaistic prayer wheel. First of all, we must take into consideration the inevitable ’popular success’ of such a method, of the apparent ease with which salvation, or at least merit, could be gained, simply at the cost of repeating magical words, or mantras or dharanis. We shall not dwell on this popularisation and degradation of the spiritual technique; it is a familiar phenomenon in the history of religions, and, in any case, it is not its popular success that will teach us the secret of the mantra-yana. The practical value and philosophic importance of mantras rest upon two orders of facts; first, the yogic function of the phonemes used as “supports” for concentration; second and this is the peculiarly trantric contribution of the elaboration of a Gnostic system and an interiorised liturgy, through revalorisation of the archaic traditions concerning mystical sound. The dharani, literally, ’she who upholds or encloses,’ was already employed in Vedic times as a ’support’ and ’defence’ for concentration (dharana). Phonemes discovered during meditation probably expressed states of consciousness ‘cosmic’ in structure and hence difficult to formulate in secular terminology. Experiences of this kind were already known in the Vedic period, although the few documents by which they have been transmitted to us seldom contain more than allusions, particularly in the form of images and symbols. It is a definitely archaic spiritual technique that here confronts us; some cosmic ecstasies of the shamans are expressed by unintelligible phonetic inventions, which sometimes result in the creation of a secret language. These are experiences, then, that are in some measure bound up with the discovery of language and that, by this ecstatic return to a primordial situation, shatter diurnal consciousness. All of the tantric yogin’s effort is expended upon reawakening this primordial consciousness and rediscovering the state of completeness that preceded language and consciousness of time. In tantrism, the tendency toward a rediscovery of language to the end of a total revalorization of secular experience is shown especially by its employment of secret vocabularies. The unlimited efficacy of mantras is owing to the fact that they are (or at least, it correctly recited can become) the objects they represent. Each god, for example, and each degree of sanctity have a bija-mantra, a ’mystical sound,’ which is their ’seed’ their ’support; – that is, their very being. By repeating this bija-mantra in accordance with the rules, the practitioner appropriates its ontological essence, concretely and directly assimilates the god, the sate of sanctity, etc. Sometimes an entire metaphysics is concentrated in a mantra. The entire cosmos, with all its gods, planes, and modes of being, is manifested in a certain number of mantras; the universe is sonorous, just as it is chromatic, formal, substantial etc. A mantra is a ’symbol’ in the archaic sense of the term – it is simultaneously the symbolized ’reality; and the symbolizing ’sign. There is an occult correspondence between the mantra’s mystical letters and syllables (the mairkas, ’mother’ and the bijas, ’seeds’) and the subtle organs of the human body on the one hand and on the other, between those organs and the divine forces asleep on manifested in the cosmos. By working on the ’symbol’ one awakens all the forces that correspond to it, on the levels of being. Excerpted from Mircea Eliade, Yoga: Immortality and Freedom, Willard R. Trask tr. Bollingen Series.LV1.